Looking for a protein that tastes good that will help you reach your goals, while being economical? 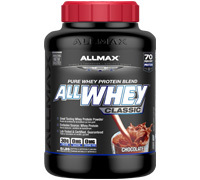 ALLWHEY Classic delivers it all! Incredible taste, 5 amazing flavors and a truly thick and creamy texture. ALLWHEY Classic delivers 30g of guaranteed, pure and tested whey protein in EVERY delicious serving! ALLWHEY Classic is a premium Whey Protein Concentrate blended with Whey Protein Isolate delivering 30 g Protein in a 43 g serving, that’s a 70% yield; tested and guaranteed! ALLWHEY delivers a clean, complete and whole protein made from the best source; 100% Whey Protein! Demand pure Whey Protein, great taste and amazing value. Demand superior taste and exceptional protein! New Premium ALLWHEY Classic is by far the BEST tasting ALLWHEY we’ve ever made! We tested over 50 versions and selected four truly AMAZING flavors. Using a completely NEW cutting-edge flavor technology, our ALLWHEY flavors will make you think you just had a freshly blended Ice Cream Milkshake. Easy to mix and even easier to drink, ALLWHEY fits your fit lifestyle! When you’re looking for a protein, you’re looking for the cleanest protein at the best price. Compare us to the competition, some are as low as 50% protein! Look at their serving size and total protein and do the math. Check their ingredients, others often contain inferior non-whey protein sources and non-protein fillers. ALLWHEY stands head and shoulders above the competition delivering exceptional value with 70% protein at a cost that will keep you smiling all the way to the gym! ALLWHEY Classic is just that, it’s ALL WHEY! 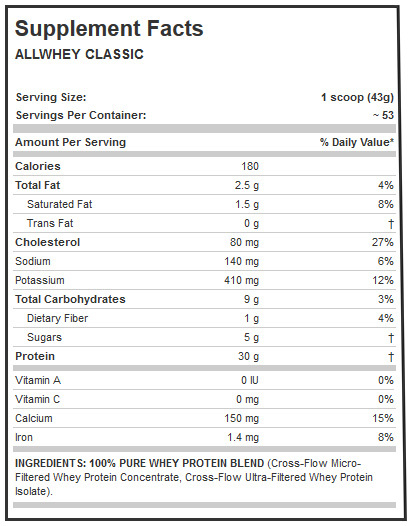 ALLWHEY has no inferior non-whey protein sources like soy or beef. It has zero non-protein Aminos and no fillers. Every gram of protein claimed is a true protein! ALLWHEY is formulated with enzymes that enhance the digestion and result in higher levels of absorption and ultimately help you better utilize the protein you consume. ALLWHEY delivers a premium quality whey protein to help rebuild your muscles after intense training. Research shows that higher protein levels post-workout help muscles recover faster. Better protein, better results! OTHER INGREDIENTS: Cocoa Powder, Natural and Artificial Flavors, Coconut Oil Powder, Corn Syrup Solids, Gum Blend (Cellulose, Xanthan, Carrageenan), Lecithin (Soy), Sea Salt, Sodium Caseinate, Sucralose, Acesulfame Potassium, Mono & Diglycerides, Dipotassium Phosphate, Sodium Silicoaluminate. ALLERGEN INFORMATION: Contains Milk (Whey). Produced in a facility that also handles Egg, Peanut, Tree Nut, Fish, Crustacean & Shellfish products. Note: Values may vary slightly depending on flavour.